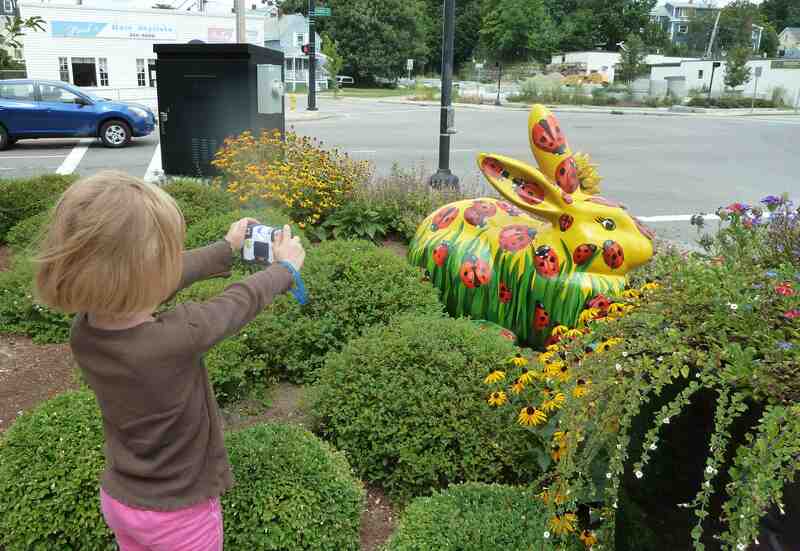 The thirteenth entry in The Five-Year-Old’s ongoing Photo Documentary series about the Dedham Public Art Project. 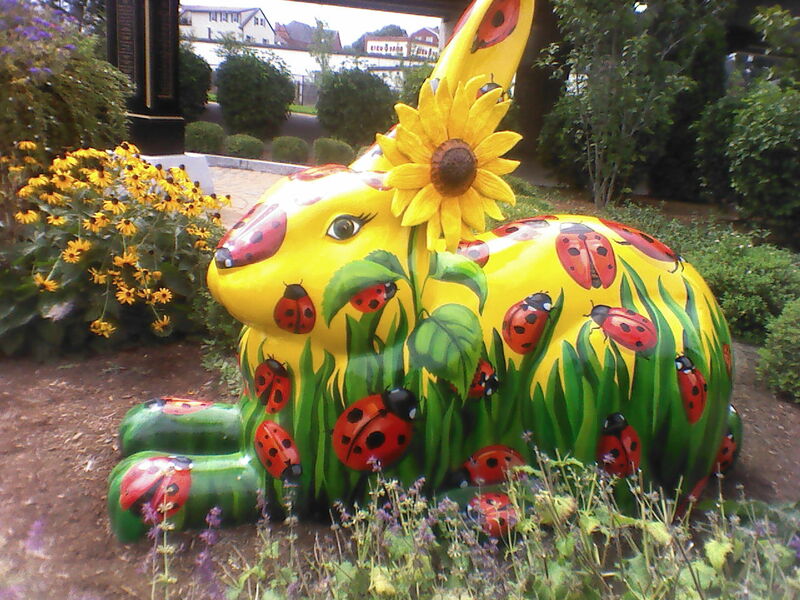 This week on Through the Lens, The Five-Year-Old visits Lady Bugs Bunny by Milton artist Susan Hoy. 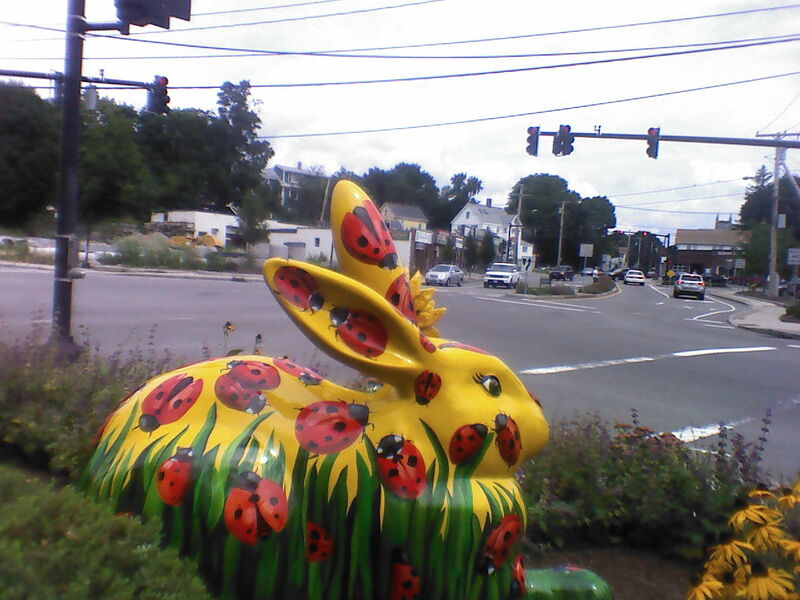 Local readers can find the bunny sitting in Dedham Crossing on High Street. As you can tell from her interview with the artists who made the Peace Rabbit, The Five-Year-Old is fascinated by the process of making these bunnies. 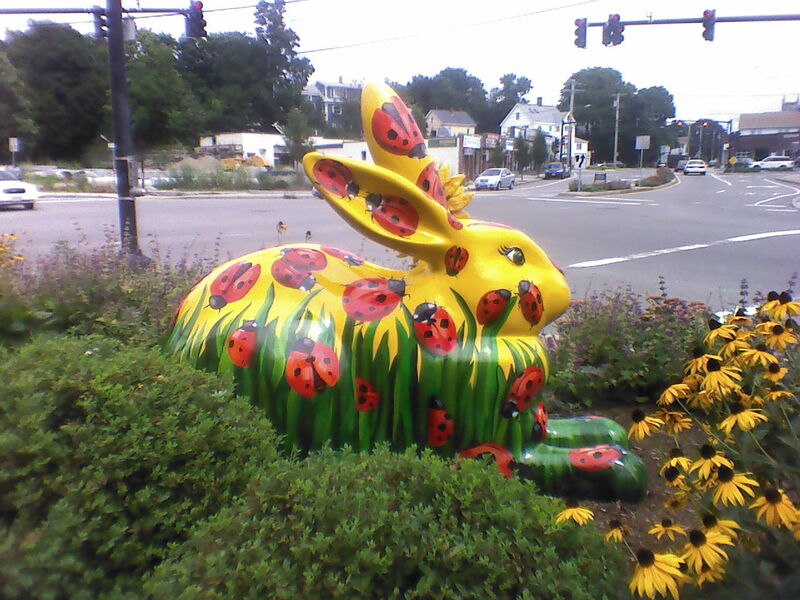 Last week, we were indebted to Dedham Tales for details about the process Catherine Gruetzke-Blais used to create her Regal Rabbit. When The Five-Year-Old saw Hoy’s PhotoSnack series, she couldn’t wait to get out into the field to document Lady Bugs Bunny herself. 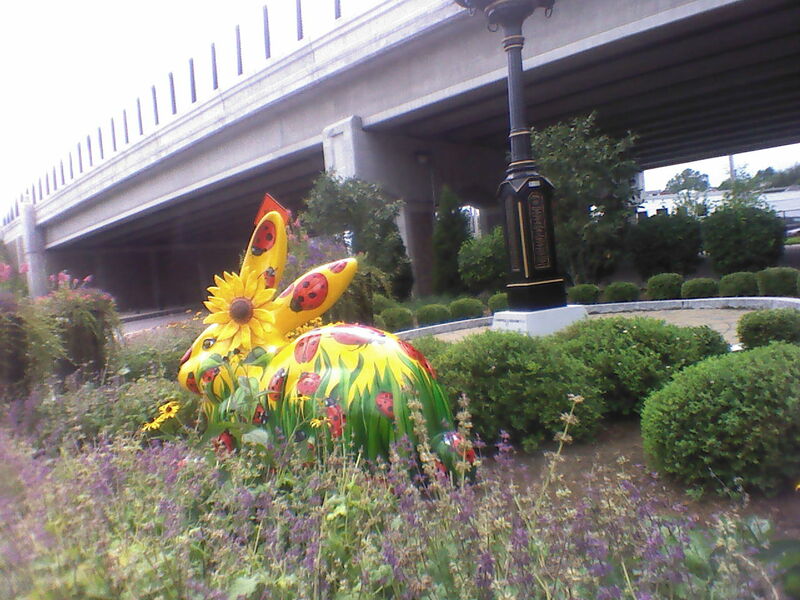 Unfortunately, the placement of the bunny at Dedham Crossing presented some challenges for The Five-Year-Old, when Mommyo again refused to allow her to trample on the plantings in pursuit of the perfect shot. Which is why this week’s close-ups aren’t very close-up, and there is no Bunny Eye View at all. With that, The Five-Year-Old presents Susan Hoy’s Lady Bugs Bunny. 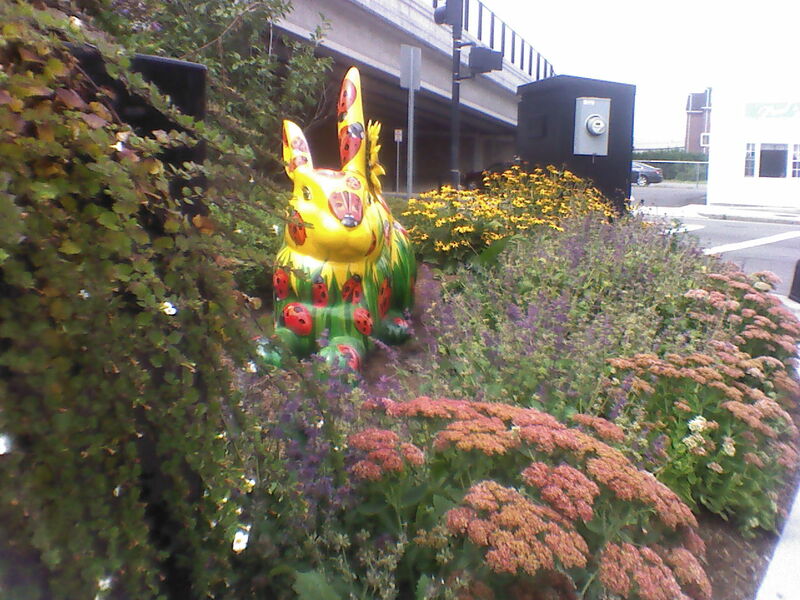 Be sure to tune in next week, when The Five-Year-Old visits Totem, The Mother’s Rabbit by Martha Taylor.